Chalkboard calligraphy is a good way to practice hand lettering because it’s erasable. Previously I made a tutorial on how to make a chalkboard wall command center, and every month I get to change the way my chalkboard wall looks. I have linked materials directly to Amazon, these items are nice to have on hand. Using a ruler you can draw lines with chalk to use as a guide for your lettering placement. Using chalk draft your lettering between those lines. Unless I’m writing more than a few words I don’t draw the lines. I like the bounce look in the letters. Write slowly and do not connect the letters. If it feels more comfortable you can connect them but erasing mistakes seems easier when they are not connected. Trace over the chalk with your chalk marker connecting your letters. Don’t worry if you don’t like it you can still erase it. Use a damp rag and a damp Q-tip. If your chalkboard marker is stubborn and will not come off, you can use a Mr. Clean Magic Eraser. Erase the chalk with your eraser. You will want to wait until the chalk marker is dry so that you do not smear your work. There are upstrokes and down strokes when you write. In calligraphy, the upstrokes are thin and down strokes are thick. Draw parallel lines next to the downstrokes in your letters to the thickness you want them. Color in the lines with the chalk marker. You can soften up the look of the words with a damp cloth or damp Q-tip to make your words look like you wrote it effortlessly. Decorate with flowers, butterflies, decorative lines, the possibilities are endless. Ta-da! 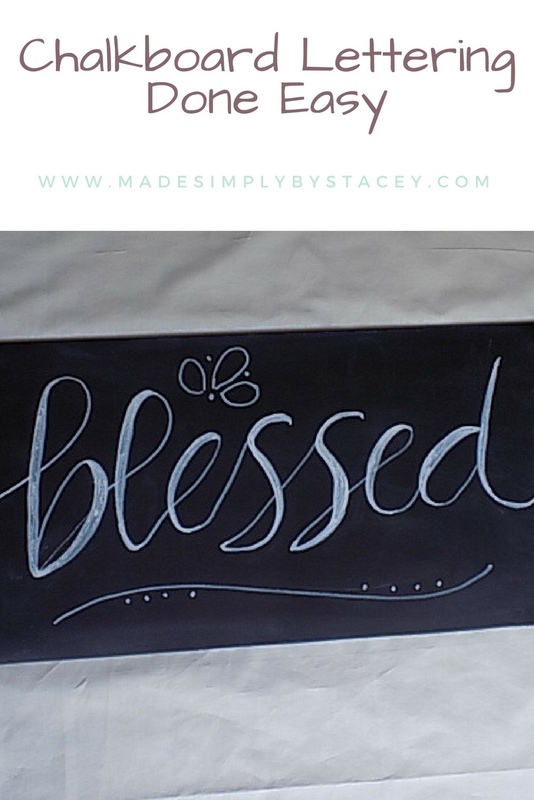 You have a fabulous chalkboard or chalkboard wall that you created. Watch my YouTube video chalkboard lettering from beginning to end.